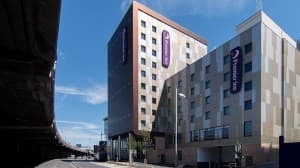 Expanding budget hotel chain Premier Inn recently opened a new 124 bedroom hotel in Brentford, west London. The 11 storey hotel is part of a combined redevelopment of the former Alfa Laval site, described as being along the “Golden Mile” of historic British industrial building alongside the elevated section of the M4 motorway as it transits from west London out to Heathrow airport. A mixed use project designed by Assael Architects includes housing, office space and new apartments as well as the Premier Inn hotel. Greenwood was involved in key elements of the building including high level screening louvres to shroud plant, essential on such a high profile building, located alongside an elevated stretch of motorway. Fire engineered extracts were provided for all means of escape staircases, to ensure the provision of safe escape were there to be a building fire. Finally, Greenwood supplied a powered smoke and pollution control system for the building’s basement car park.